There are several types of credit cards available in India. The type of credit card is decided based on the benefits and rewards they offered on a specific category and spend requirements. For example – If you love to do shopping online, then a “Shopping Credit Card” is best for you. You earn discount, cashback and rewards on these types of credit card. Suppose you are frequent traveller you can benefit a lot from Travel credit card. These types of credit cards helps you to earn air mile, access to airport lounge etc. From above examples you must have understood that for specific requirement and usage Credit Card Company offers specific category of credit card. Too many credit card options create anxiety and you may end up taking wrong decision. To help you out, I’ve compiled some basic explanations of credit cards, as well types of credit cards and usage. You can select type of credit card based on your requirement and usage. There are various options of cash. Credit card is one of them. Credit card is a plastic money that makes life very simple. You can use credit card for buying goods and services on credit. You need to return this money every month or at latest before interest free credit period else you need to pay interest on your outstanding balance. 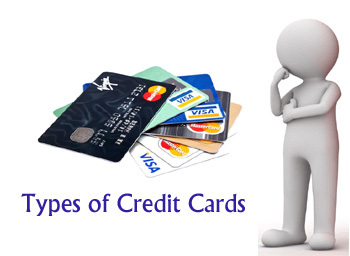 After understanding basic of credit card let’s take a look at types of credit cards available in India. Business Cards are designed for businessmen and corporates. It is one of the fastest way to get finance to run your business. These types of card is also known as corporate credit cards. Business credit card offers benefit such as expense monitoring and control, insurance, business saving plans, lucrative travel and accommodation deal, higher credit limit and advance facility. Few best credit card in this category are SBI Corporate Platinum card, Business Money back HDFC Card and My Business Credit card from Axis Bank. Balance Transfer credit cards or facility allows cardholder to transfer existing outstanding balance from one credit card to other. So, if you are worrying about massive credit card dues you can use these types of credit cards facility. Bank charges normal processing fees for balance transfer. Most of the balance transfer card do not charge interest rate for first three months. Few recommend bank of opting balance credit card/facility are ICICI, SBI and Standard Chartered. Everyone likes to earn more money if you are one of them you should try Cashback Credit Card. Cashback Credit cards allows you to earn money spending money. The cashback amount and rewards depend on the issuer. Best Cash Back Credit Cards are Citibank Cash Back Credit Card and Standard Chartered Manhattan Platinum Credit Card. Co-branded credit cards are offered by bank in association with a retail brand, online e-commerce website or travel aggregator. This card is especially designed to offer privileges associated with co-brand. If you are married to specific brand you can plan to opt for these type of card. Few examples of co-branded credit card are Yatra SBI Credit Card, IRCTC SBI Platinum Credit Card and HDFC Snapdeal Credit card. Few Credit cards are exclusively designed for the women. These credit card mainly focus on shopping rewards, cash back as women are fond of doing extensive shopping. Apart from that, this card also offers extra benefit such as shopping voucher, surcharge waiver, insurance etc. Few examples of credit card for women are HDFC Bank Solitaire – Premium Women’s Credit Card, Citibank Rewards credit card, ICICI bank coral card. If you are fond of shopping you can surely go for following best credit card for online shopping in India. These type of credit card is designed for offering online shopping benefits. You can avail discount, e-voucher and option of shopping on EMI via these types of cards. Few popular online shopping cards are SBI Simply Click and Axis bank buzz credit card. The main feature of Classic Credit Card is global acceptance, cash advance, interest free credit period, supplementary card benefit, card lost insurance and dedicated customer support. Few example of classic credit cards are IOB Classic Credit card, Indian Bank Global Classic Credit Card and ICICI Bank British Airways Classic Credit Card. If you are spending lot of money on entertainment such as movie, drama, shows and events you can plan to opt for entertainment card. These type of card is mainly designed to offer amazing entrainment benefits. It also offers extra benefits such as reward points and discount on dining. Best Entertainment credit cards are HDFC Titanium Times Card and Kotak PVR Gold Credit Card. Fuel Credit Cards are specially designed to offer benefits on fuel including discount, cashback, and surcharge waiver. You can make use of fuel credit card and bring down the cost of fuel expense from the household budget. If you spend heavily on petrol and diesel you can use this card. Few recommend fuel credit cards are Standard Chartered Super Value Titanium Card, ICICI Bank HPCL Coral American Express Credit Card and Indian Oil Citi Platinum Credit Card. Life Style Credit Card as name suggest it is a credit card that offers benefits on changing lifestyle and income of cardholder. These type of card offers shopping, dining, travel and other exclusive benefits on lifestyle. One such card is Axis Bank Signature Credit card with Lifestyle benefits. Prepaid credit card as name indicates it is preloaded credit card with specific amount. There are two types of credit cards in prepaid category namely domestic currency and forex credit card. Prepaid card is as good as debit card. You need not to worry about clearing dues and interest rate as usage is allowed only based on money deposited by you. Premium credit card as name suggests, it is a credit card for the premium customers. These types of card are designed to provide extraordinary premium services such as club membership, concierge services, dining privileges etc. High income and high spending are requirements of premium credit cards. If you have high-income level and capacity to spend. Best premium credit cards are HDFC Regalia Credit Card and Citi Prestige Credit Card. A student credit cards are card that is offered to student at college level. There are very few banks that offers student credit cards in India. The main requirement of this credit card is student should be above 18 years of age. These type of credit card is offered against employment document, Income tax return or income proof. A Secured Credit Card is card offered by bank against fixed deposit. This deposit serves as credit limit for the cardholder. If you don’t have good credit history and you are facing problems of getting credit card you can use this option. In this card if cardholder default on payments, bank can deduct the amount from the deposit. Travel Credit card is best suitable for the person who is travelling frequently. Travel credit card offers multiple benefits like air mile, free access to airport lounge, benefit on accommodation, travel insurance benefit etc. Few recommended travel credit cards are Citibank PremierMiles Credit Card, American Express Platinum Travel and JetPrivilege HDFC Bank World Credit Card. The above list includes most popular credit card types. However, there are few other credit cards types and names that are defined by banks such as contactless credit card, life time free credit card, virtual credit card, credit card for low income group, gold credit card, Platinum credit card, signature credit card etc. A credit card can be a very good tool which provides multiple benefits. However, you have to use credit card wisely. Excessive usage of credit card leads to a huge financial burden. If you decide to use a credit card and trying to find best credit card here are few important credit card tips for selection and usage. Know your payment habit and spend habit before making selection of credit card. Compare features and get information about annual fees, interest rate applicable and Interest-free grace period before taking credit card. Get complete information about credit limit and interest free credit days before opting credit card. It advisable not to keep multiple credit cards. I hope above credit card tips and types of credit cards help you in making a selection of credit card. If you are still facing issues in the selection of credit card post your query in the comment section given below. « How to Find Best Child Education Investment and Saving Plan?